I recently posted the photo down below on my Instagram account. And one of my followers @tania_perin had asked me if those were the infamous bullet holes from the war. In all honesty, I had no idea. I never even really noticed those holes. I guess I just imagined them to be part of the wears and tares of an ancient building. He had told me that yes, those are bullet holes from the war BUT not from WWI but from a war from the 18th Century. On September 8, 1796! The Battle of Bassano. I’ve never been much of a history fan while growing up in California but after living in Italy for more than four years, I can say that has changed. Amazing to find such beauty in such a bad memory or era and yet Bassano is still ALIVE and THRIVING. I definitely recommend going to Bassano del Grappa. For the grappa, a spirit produced in Bassano. The landscape and views from the Alpini Bridge are spectacular. Bassano is an underrated city! The tourists haven’t discovered it yet. I’m definitely going to do a day trip in the next two weeks. I’ll do Asolo and Bassano! 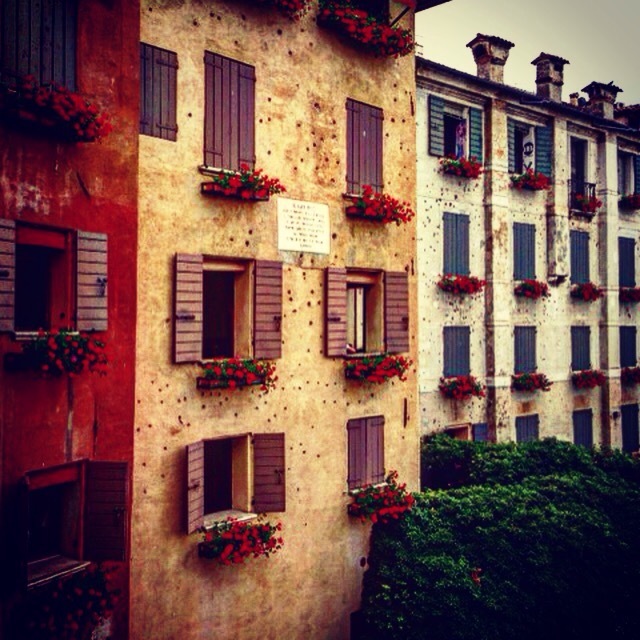 Have you ever been to Asolo or Bassano? Have you tried Grappa? That is fascinating! All the more reason to love Bassano! I agree! Remember the walk way with all the trees lined up? Well, if you look closely enough on each tree is a medal or iron cross with the name of the solider who died in that war! I’ve really got to get back to see that! me too!! Next week, I am going to go back! So much to see.